A couple of weeks back, I talked about Vasisthasana/ Side Plank, as an amazing pose to strengthen the sides of the body. I talked about the importance of strengthening our sides, when it comes to supporting our spine, as clearly so vital. Yet, let’s not forget that we can also think about re-lengthening our side body, to release tension, increase mobility, improve breathing and stand taller. Equally, as with all areas of the body, we need to be finding that balance between strength and mobility, support, stability and flexibility. The side body, so what is it? latisimus dorsi (those potentially big muscles under the armpits), which I know if you surf, can accumulate knots, restricting shoulder mobility. serratus anterior, as we go down towards the ribs, and the intercostal muscles in between the ribs – these can all pick up knots and tight spots which can even inhibit our breathing. low back, in particular the quadratus lumborum muscles, either side of the spine, which enable us to side-bend and often work really hard. our lateral pelvic stabilisers on the outer hips and tensor fascia lata, a muscle we know gets tight, that then can pull on the iliol tibial band, running alone outside of the thigh. So, try this great pose: the Lounging Lizard – it’s simple, subtle but effective. Come into it from a side plank – with one foot placed on the floor, lowering the lower hip to the floor, so you’re on your side. Straighten up as much as you can and push away through your back heel. You have the option to come down onto your elbow to reduce the side stretch sensation, and then drop your head towards your bent knee. I love this pose. It can be quite subtle for some and more intense for others but it has this wonderful sense of lengthening through that lowest side, particularly the waist area but nicely into the outside of the hip, I find. Thank you so much for joining me and I can’t wait to see you soon. As always, leave me a comment just below. Let’s not forget our side body when we think about core strength. There are so many muscles that wrap around us from the sides, supporting our spine, hips and shoulders, yet the side body can often be forgotten. Side plank is one of my favourite poses for a number of reasons: it strengthens the transverse abdominus, the obliques, the quadratus lumborum and serratus anterior, as well as the other rotator cuff muscles and the spinal extensors. → If we’re not actively strengthening all of the ‘core’ muscles, including the sides and the glutes, then something will be overcompensating, usually the low back. It’s a simple pose – but not an easy one! It’s like trying to find Tadasana, your perfect standing posture, and then turning it on it’s side! It can be very easy to allow the spine to flex or extend, to let the hips sink or to lift them too high, and to let the supporting shoulder drop against gravity. But, one of the best things about the pose is the range of options it offers. As with any pose that requires really good strength, working towards it in steps, in order to build efficient strength to hold the full posture is always better than struggling and persevering with the full thing! Keep the lower knee on the floor. Start in Plank but drop the knees where they land. Take the right foot back, turn it parallel to the back edge of the mat. Turn the left foot and shin slightly off the mat at an angle. Push the left hand down and hug the shoulder in. Lift the hips but lengthen the tail bone to stay in line. Place the top foot on the floor. Start in Plank. Turn to the right, placing right foot on the floor in front of the hips. Drop the left heel so you are on the outer edge of the left foot. Push the left hand down and hug the shoulder in. Lift the hips and keep lengthening the tail bone, as before. The full pose. From Plank, turn to the side, stack the feet. Lift the hips, but not too high. Lengthen the spine, reaching from the crown of your head and the heels. Keep resisting gravity by pushing the balancing hand down and hugging the shoulder in, away from the ear. This is a fun pose to incorporate into a flowing Vinyasa practice – I think so anyway! and is a great indicator of building more strength. We’re going to be exploring many more variations of Vasisthasana in my next workshop, on Sunday 24th March in St Agnes, as well as other fun and focussed ways of strengthening and releasing the side body, using Myofascial Release, Yin Postures and Vinyasa Flow. Book your place here. What is your experience with this pose? Let me know in the comments below. What is Myofascial Release and how is it linked to yoga? If you’ve been practising yoga with me for a while, in-person or online, you’ll probably know about my love of incorporating myofascial release (MFR) into a yoga practice. But in case you haven’t, unsure what it is, or need some MFR inspiration, read on! MFR is a way of self-massaging, using props – usually tennis/ lacross balls, rollers or block, to apply pressure to the myo-fascia, releasing stored tension to relieve pain and restore movement. Myo-fascia refers to both the muscle and the fascia that surrounds it. In fact, fascia covers our entire body and plays a huge part in our mobility. How do MFR and yoga differ or work together? In a dynamic or Vinyasa style yoga practice we mobilise the joints, whilst building strength and support around them, protecting us against injury. We can improve our flexibility here but we mainly enhance strength and mobility, warming the muscles and fascia. This can keep us supple but does not release deep-set tension. In slow Yin style yoga, we hold poses for longer, allowing the body to relax into the shapes. The tissues have the chance to re-lengthen over time here and release some of their deeper set tension. There is no strength involved and we have more opportunity to improve our flexibility. Myofascial release works similarly to Yin yoga, in that we take our time and stay with the applied pressure for up to several minutes. This can often be in a Yin posture but not necessarily. Allowing the tissues to relax against the pressure can help specific areas of tension to dissolve, improving not only our flexibility, mobility and range of motion but also our blood circulation and eliminate pain. As you can see, it’s pretty useful, if not essential, to be doing all three practices regularly! 2 MFR techniques for the shoulders and hips/ lower back. Shoulders: lie on your back, with your feet on the floor, hips propped up with a block/ bolster. Place a ball either side of the spine at the base of the neck. Take slow breaths here for 1-2 minutes. Gradually roll the balls along the top of the shoulder blade towards the outer edge of the shoulder, pausing for a minute of two along the way – especially if you find a tender spot. Hips/ glutes/ low back: lie on your back with knees bent and resting against one another. Place a ball either side of your sacrum and take slow breaths here for 1-2 minutes. You do not need to feel a lot. Gradually roll the balls along the tops of the glutes, again pausing along the way, until you reach the outer edges of the hips. Go back the same way, or return to a good spot. *MFR can feel tender on pressure points but it should not be painful. If you do feel sharp pain or tingling, stop. Join me this Sunday morning, 27th January, 9-11am, in St Agnes at the Wellbeing Studios for a creative combination of dynamic and strengthening Vinyasa Yoga, calm and restorative Yin, plus the releasing benefits of myofascial release. Please bring 2-3 tennis balls. 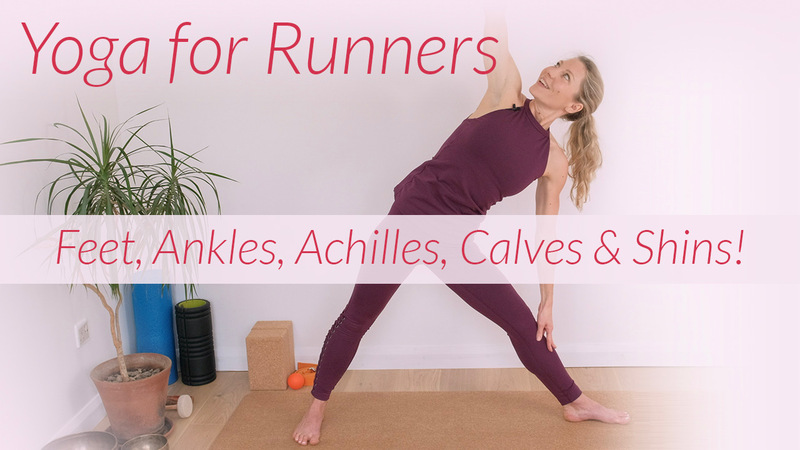 Healthy feet and lower legs, that are strong and flexible, are absolutely vital for finding your optimal running technique and staying injury free in this area. Don’t let this area be overlooked! Ideally do this 28 minute class on a non-running day, as much of it is standing sequences but we wind down with some floor based poses and a little myofascial release. Have a tennis ball to hand if possible. Check out these previous blogposts, if you haven’t already! Yoga for Feet and Yoga for Achilles.